(LT)>> Welcome to Truck Tech where today my videographer Eric and I have hit the road for a purpose. It's a really exciting time of year for us at Truck Tech because it's time to go shopping for a new project vehicle. Now the possibilities are really endless. There's a lot of different ways that we have built trucks in the past. 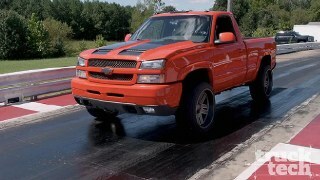 Everything from lifted to lowered, two wheel drive to four wheel drive, street trucks and even race trucks. So the question is what are we gonna buy this time? We're really gonna kind of put the spin on it of like my first truck. 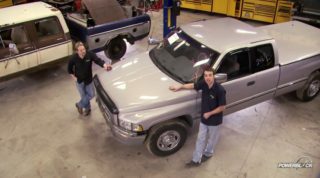 Maybe you're a high schooler, you don't have a lot of money to put together, and you want sort of a classic truck that can sporty, that can be fun, or that can have some utility. So I did some looking online and I have one that I've picked out that I think is gonna fit the bill. Well hello beautiful! ♪ ♪ How's it going Victor? (Victor)>> Hey doing good LT, how you doing? (LT)>> Doing very well. I hope this is the truck cause that one looks beautiful. (Victor)>> It is sir. Here's the keys. Check it out and see how you like it. (LT)>> Thank you. 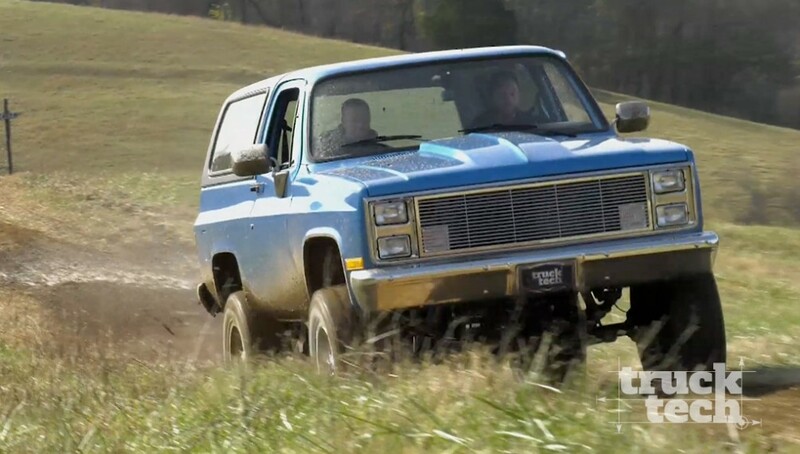 ♪ ♪ This is a 1988 Chevy K-1500, part of the GMT 400 platform that Chevrolet and GM made from 1988 to 1998 in pickups and until 2000 with Suburbans and 3500's. Right now this is probably one of the most popular body style of trucks that you can find just behind the square body Chevy, and we've built a ton of those recently. So it's time to mix things up a little bit. 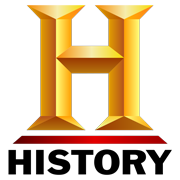 Also for me this is kind of a little bit of a nostalgic truck because when I was a kid this is what I saw on t-v on the commercials with that Bob Segar song playing, "Like a Rock". You know the truck bouncing over the ruts and through the mud. This is just the classic American pickup and we're gonna take it home. There are a few different engine options that you could have got when you bought this truck brand new. 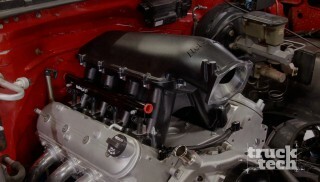 The four point three V-six, the 305 V-eight, and this, the 350 five point seven liter. Now this one is injected with a t-b-i. I think they were about 190 horsepower when they were brand new and this truck looks to be about as all original as it can get. A lot of guys will swap out the air cleaners, throw headers on. Some guys will even convert them to carburetors but this truck, it's a time capsule. About as stock as they come and definitely a good place for us to start. Now with a truck that's almost 30 years old rust is always a concern when you're looking for a project vehicle. Even on one that looks as nice as this because paint can hide a lot of stuff. So the first thing that I always do is take my fingers and carefully run them along the back side of the inner wheel well. Now this will do two things. Number one it lets me feel if there are any rust holes or it lets me feel if there are any weld seams from previous rust repairs. This one checks out. It's actually really solid on the back side. The next place that these trucks rust out a lot are the cab corners. Now it's really easy to fill something over, paint it, and kind of hide it, but you could easily take your thumb and kind of press in and feel a soft spot. This truck again, really solid. So it had been repaired it's been repaired properly, but cause there are no weld seams I can tell that it's been done right and there is no rust in the first place. The last place is underneath the doors. You always want to open up the doors and check out the seam on the bottom. There are drain holes both front and rear that often get plugged up with dirt and debris, especially if you park underneath a tree. The doors will fill up with water, and as we all know water causes rust. So the bottoms of these doors often will be blistered out and just caked with rust. This one again, real solid but those are three areas that I always check for rust when looking at an old truck. Now there is one problem that all these old Chevy's have almost without exception. Now check it out. If you follow this style line down the door it seems to line up, but as soon as you open the door just a little bit it clearly drops down, and that has to do with the door hinge. There's a small bushing in the front that wears out, and it's a dead giveaway cause you can rattle the door up and down, and you can feel and see that play. It's an inexpensive fix and certainly not a deal killer but just something to look out for. Anytime you put oversized tires on a truck with independent front suspension the front end can take a beating. So there's a couple of things that you can look out for to see if things are worn out. The first dead giveaway are the tires. Now these are brand new but if the front end were worn you'd have uneven tread wear on the outside shoulders of the tire. The second thing that I look for are ball joints. 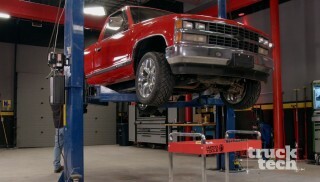 Now this truck has a new upper control arm as part of the leveling kit but has a stock lower control arm. A dead giveaway here, the lower ball joints are actually bolted to the control arm. The factory ones were riveted in. So we know that they have been replaced at some point in their life, but another tell-tale sign is the bushings, the boots, everything looks brand new. So I know this front end has recently been gone through, but if you look at all that stuff and you still can't tell if it's been replaced or not here's another test you can do. Grab the tire and shake the crap out of it. Shake the whole truck back and forth, back and forth, and just kind of listen for any sort of clunks, and have somebody watch for play inside on the ball joint. If it's tight there won't be any movement. 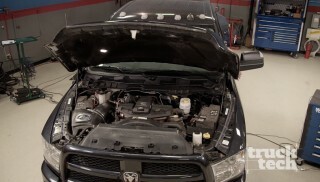 So a couple of things you can quick and easily check to tell the health of the front end of your truck. ♪ ♪ Now I've done my homework on this truck, checked it out, and even talked with the previous owner about its history. And even though it has a clean Carfax, I'll still take it out for a quick test drive just to be sure. 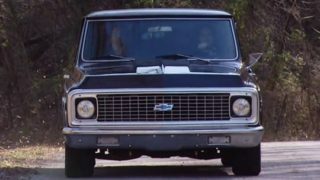 ♪ ♪ If you guys have ever owned an old body style Chevy it brings you back the instant you get in. You hear that sound that the door makes when it shuts. The sound of the starter when the engine turns over. It's just pure nostalgia. Right off the bat I can tell we got a good one. This thing drives smooth, and clean, and straight. There's no shaking from the steering wheel. The tires run true. It's a good solid truck. There's really two different ways we could build a truck like this. The first and the most common is what everybody would probably do. Lift it up a little bit higher, put some bigger wheels and tires on it, 35's, 37's. A lot of guys will say put a solid axle under the front end. Just make a big bad off road looking truck. The other way you could do it. Well you could go a little bit lower. If you guys know me the last thing I want to do is the same thing that everybody else wants to do. I'm not gonna give away exactly what this truck's gonna look like when it's done but all I can say is it's gonna be different and it's gonna be awesome. So y'all will have to stay tuned. (Narrator)>> Coming up, we're back in the shop with projects then and now. How will they perform? Stay tuned to find out. (LT)>> Well we brought our '88 K-1500 back to the shop and have a title in hand, and what we have planned for this truck is gonna blow some of your minds, but more on that later because look at who showed up. (Jeremy)>> Well I wouldn't miss the opportunity to take our '89 square body out onto some dirt. I'm here to tell you I'm happy with the way she turned out. (LT)>> Well hold up, dirt? What about rocks, and trees, and mud, and ditches, and all that good stuff? (Jeremy)>> Dude, have you seen this truck? Have you seen how nice it is, or remember how much time I put into that paint job? (LT)>> You're right, there are a lot of hours in this truck. So here's a quick look back at how we got it looking as good as it does today. (Jeremy)>> Lay in it, go! ♪ ♪ Before we started working on this 1989 K-five Blazer we hit the trail just to see how a 30 year old stock truck would perform on some challenging terrain, and let me tell you we had a blast. (LT)>> Whoa! Now surely you could see that tree right? Our plan was to design something that looked great and was a heck of a lot of fun to drive, and we also knew there were many different ways we could make this happen. We decided to jump in and go all out. So first thing we did was bring it into the shop and immediately tear it down. We removed the front sheet metal, the engine and trans, stripped out the whole interior. Every last part of this truck was disassembled, and we were left with a big pile of parts. (Jeremy)>> And if you're going to take on a project this size it's always a good idea to see what the last guy left you under the original paint. So the first order of business was to get the truck stripped down to bare metal so we could get to the few rough spots that needed to be addressed. Once back to the shop we immediately applied a coat of epoxy primer that would prevent any flash rust. Lucky for us there were only a few small spots that needed to be addressed. We cut out the rot, formed up some new patches, welded them in, and metal finished it out. (LT)>> At this point we were fully committed. So next up was to tackle the frame. We began assembly with a four inch lift kit and some Foxx shocks. A bulletproof 14 bolt full floater rear axle was sourced from a local junkyard. Out front we converted the original 10 bolt to a matching eight lug bolt pattern using Dana 44 parts. We ditched the t-b-i 350 for a stout 454 HO crate engine, and backed it up with a four-L-80 automatic trans. 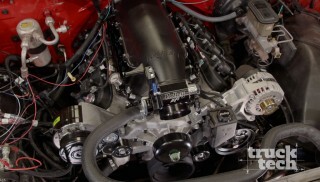 And since we really wanted to push the power over the top a little while later we added a Procharger DOne-SC supercharger, which will pump about six pounds of boost into that big block, making a fun ride which will get down the street, track, or trail in a hurry. (Jeremy)>> As always we hung and pre-gapped the sheet metal. Then sprayed the entire truck with BMW "Protronic Blue", and I'm telling you this color is hard to lay down. It's loaded with pearls and metallics. So if not done right it could look blotchy or uneven, but this came out looking like a million bucks. So we had a rendering drawn up, which is what we wanted the truck to look like. What do you think, pretty close huh? 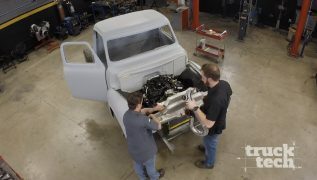 (LT)>> I'd say we've pretty well nailed it, and from that point on it was just a simple matter of reassembling the sheet metal to make it look like a truck again. For the interior we chose a minimalist approach. Off road suspension seats and a few basic trim panels do the trick. Richard from Magnaflow came in and built us a custom two into one exhaust, and to simplify the electrical we got rid of all the factory wiring and replaced it with just the basics with some parts from Ron Francis. (Jeremy)>> To get power from the transfer case to both axles we hit up Tom Wood's Custom Driveshafts. They sent us a slip yoke eliminator kit with a double cardan shaft for the rear, which will allow more wheel travel and smoother operation. (LT)>> To top of the big block we installed a Demon 850 c-f-m blow through carburetor. We didn't show you guys the final reassembly of the Blazer cause let's face it, it's just a bunch of small boring parts. Window seals, regulators, and a bunch of other odds and ends. (Jeremy)>> But I can show you how we got this charcoal textured finish on our topper. First we roughed up the surface with 80 grit on a d-a. Then back masked to protect the underside. Our tennable raptor liner mixes with activator as well as our color, which is a charcoal we picked called "Modern Steel". But now she's fully bolted together and ready to rock. We have a beautiful and stylish looking Blazer that would be at home sitting at a car show, driving on some back roads, tearing it up on the track, or just daily driving it. (LT)>> The K-five looks pretty classy sitting under the lights in the shop but we actually built it to be a fairly capable off road machine as well. (Jeremy)>> So coming up next we're gonna get this K-five out of the shop and into the woods, and see what kind of trouble we can get into. (LT)>> Yeah! Man this thing is nuts! (Jeremy)>> We're at Wooly's Off Road Park in Lynnville, Tennessee. It's 600 acres of some of the most beautiful but challenging terrain. With trails from mild to wild. Good day to go wheeling. ♪ ♪ Our expectations weren't very high for our K-five when we came here almost 15 months ago, but now we've got more power, better suspension, and bigger axles. Today we plan to have a lot more fun. ♪ ♪ Where are the running boards? (LT)>> I've got a step ladder in the back. (LT)>> Now it's taking every bit of it too. (Jeremy)>> I think we may have come off the ground that time. See we probably would have been lucky to make that hill before. (LT)>> I tell you I am a little bit worried about that 10 bolt front axle and all this torque that we're putting through it. But let's see what happens. ♪ ♪ Even though this is a full size rig, these trails are pretty tight. It's really the short wheel base is what makes the best wheeling rig. (Jeremy)>> Yeah, that's what I like about the K-fives. If I had to pick any one personally for myself I think it would be a K-five for that fact. (Narrator)>> Next sink or swim? (LT)>> Alright man, so it's the end of the day. We've got a big giant mud hole here and high power four wheel drive truck. So what do you say? (Jeremy)>> I saw we hit it man. This is the kind of stuff I like to do. So let's see if we can bury it up. (LT)>> Well we've got another truck just in case we can't get this one out. So what's your strategy? (Jeremy)>> We may need that other truck but I say we creep up to it. We'll just hold it to the floorboard and see if we get to the other end. (LT)>> It's all you man, let's do it! Hey man if you bury this thing I'm walking home. You're on your own. (Jeremy)>> You may not be able to get out of here and walk anywhere. (LT)>> I got my swimming trunks. (Jeremy)>> That's not too bad. I think we ought to go through the middle. (LT)>> I don't know man. (Jeremy)>> Back the same way? (LT)>> Oh, oh, not that way! Come on man, you better throttle out! Yeah! ♪ ♪ I think there's a little horse manure mixed in with that. Kind of got a little bit of organic taste. We're going a little deeper this time. Everybody ready? Okay so just so you know this truck has no winch, no tow hooks, and the tow straps are in the other truck. (Jeremy)>> You ready to push? Here we go! (LT)>> Yeah, keep on it! We're almost there. Yeah, woo! Yes! (Jeremy)>> Yeah this baby can do anything. (Jeremy)>> Just so everybody knows I can't see out of the windshield. You may have to direct me a little. (LT)>> Keep it down man, keep it down. (Jeremy)>> She's buried! I'm putting a dent in the floor! (LT)>> Uh oh, keep going, keep going. Keep it alive, keep it alive. (LT)>> Yeah, yeah! Keep it up! ♪ ♪ Keep it up! (Jeremy)>> Come on truck, come on baby! (Jeremy)>> Come on girl! ♪ ♪ I can't see! (LT)>> You're good. All right, we're out. Oh, right! ♪ ♪ Yeah! (Jeremy)>> I'd say we found the deep spots in there. I think LT got a little wet. (LT)>> Holy cow man. You know what the doors are shut so I'm okay, but that was a knock out of the park man. (Jeremy)>> That was awesome man, I love it! (LT)>> You can't get a better day than that. (Jeremy)>> Golly that was fun! (LT)>> You've got that car show coming up this weekend and you've got some cleaning to do. (Jeremy)>> I'm not cleaning this thing. (LT)>> I'm driving the red truck home. Remember you can check out Powernation TV dot com for anything seen on today's show. Someone we won't be seeing after today is my co-host Jeremy Bumpus. 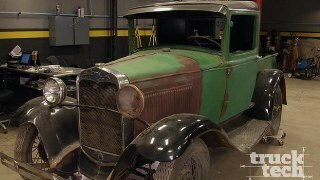 After three and a half seasons he's moving on back to his custom hot rod shop he owns in north Mississippi. (Jeremy)>> I absolutely had a blast getting to host the Truck Tech show for quite a while now. Met a ton of cool people. The main thing was I got to teach a lot of people, and that's what I was after. That was my main goal. I couldn't be more grateful for who I worked with and what I was able to do and accomplish through these years, and I had a ton of fun and I'm sure gonna miss it.